"Never test run anything that compiled successfully." I make an appearance in the latest Skritter newsletter discussing my experience learning Chinese. I did not choose the headline though. For anyone interested in learning Chinese or Japanese, I definitively recommend Skritter. 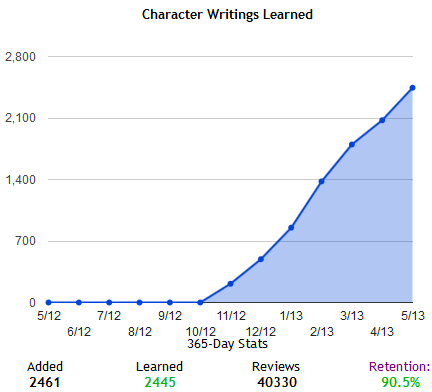 I started using it almost exactly 6 months ago now, and I have picked up a bit over 2400 characters. Talking with a friend about babies some time ago she mentioned that young kids pick up 10 words every day., which of course is amazing. It's generally acknowledged that learning languages is something that kids do much easier than adults, but thinking about it, I've been picking up 13 characters a day on average, and about 35 words a day at my current rate. As an adult, I find that mind-boggling. So language learning at a similar speed or even faster is certainly possible for an adult. Of course, I need to make a conscious studying effort, rather than just existing within an environment where a language is spoken around me. But even so, using an effective method, which Skritter does, can get you a long way, even as an adult. Of course, YMMV, and maybe the reason I ended up in the newsletter was because I was a power user well above the average, with a consistent learning curve. The average user may have a harder time. Certainly, having a Chinese wife and Chinese spoken around me on a daily basis kind of helps. And I also believe you need a traditional school course as a basis to get going. Words and characters is great, but you do need grammar too.